These are sometimes known as a Magnetic Longwire Balun. 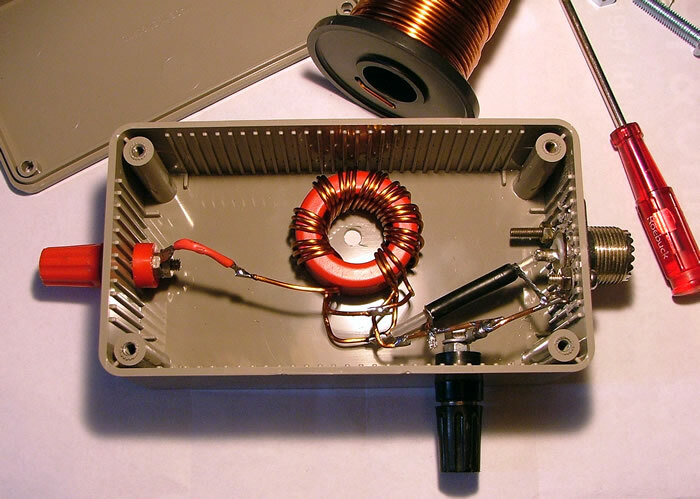 Its really an impedance transformer (9:1) to feed a high impedance, end fed (unbalanced) random wire which is likely to be a few hundred ohms, and transform it into something closer to a 50Ω (unbalanced) coaxial input, hence UnUn. It can however also be used as a balun by not grounding the other half of the balanced output. 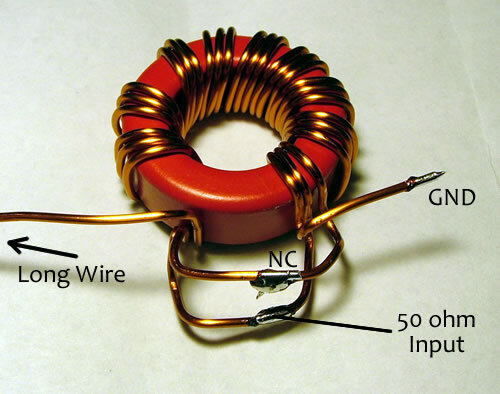 The toroid is a T130-2 Iron Powder core, with 3 x 9 turns of 18SWG enammeled copper wire, and the connections can be seen below. The triple winding connections. 8 turns is shown here, but more turns is preferred. 10 would be ideal. Yes there will be loss in any transformer. How much, I have not measured. See how warm it gets?! What’s the power rating on this design? I’m going to be running this on my Kenwood TS830-S through an MFJ tuner… This radio puts out 200 watts. -Would I be over-loading the 9:1 UnUn with this radio using this T130-2 Toroid? -I’ve seen some variants of this design using a T200-2. Would that be better for higher power? -I have plenty of 12 gauge magnet wire at home. Would using a heavier gauge wire change the efficiency or function of this design? The T130-2 will be OK for ~100w. I would use a T200-2 and a few more windings for 200w. 12 gauge wire will be fine for your requirements. Thicker wire just makes it trickier to make. I’ve heard varying comments about ground/vs. 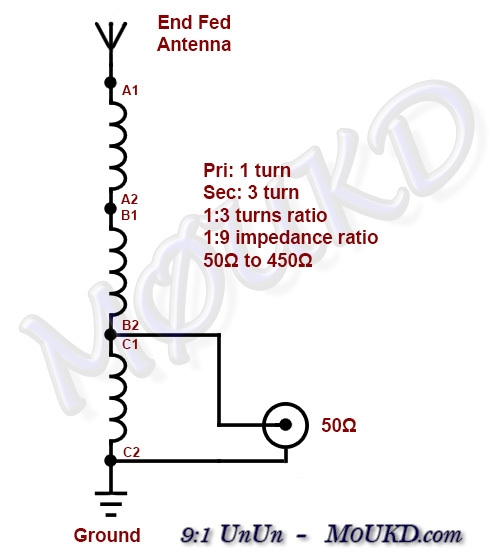 no ground for this type of antenna. Any ideas here? Also heard that the coax to the tuner will radiate as well. Can I mount this as an inverted V on a single support pole (for portable/field day use) and then somewhere in the coax cable run from the UnUn to my tuner, simply use a 1:1 Current Balun or RF choke? What length of coax run between the Unun-to-choke and choke-to-tuner should I consider. In this instance should I care if the un-choked section radiates — (it’s trying to be the ground). The UnUn should have a very short ground lead. With a good ground, the coax will not radiate. You could use it as an end fed inverted V, then your UnUn would be close to the ground system which is what you want. Again, with a good ground, no choke will be necessary and the antenna can perform at its best. Keep the coax between the UnUn and tuner as short as possible. Ideally put the tuner next to the UnUn, or better still, use the tuner instead of the UnUn, at the feedpoint of the inverted V! Hi, I have just built one of these devices and seem to have a mounting problem for which I have received conflicting advice. So, do I mount the UNUN high and close to the “long wire” and consequently have a long (15ft) earth wire. Or, do I mount the UNUN close to the earth spike at (nearly) ground level? Ideally close to earth, so the ground wire is as short as possible. I am building a 9:1 UnUn for an end fed antenna. Can I use stranded wire for the windings around the toroid or must it be solid wire? The toroid has not arrived yet from my supplier so I can still get solid wire if necessary. Stranded wire should be fine for this type of transformer. Teflon insulation would be best for higher powers, but it’s a bit pricey! This must be one of the most useful and well presented hobby radio projects on the web. Clear step by step instructions and photographs. Not only that, it’s appropriate both for qualified TX use and SWL RX. Good work, well done, thank you John. But it doesn’t stop there. The rest of your web site deserves investigation too. Thanks for the nice words Bob! Hi John, first many thanks for making this article and photos available! My question is regarding frequency limitations. I would like to use my long-wire on 6M and possibly 2M. Any concerns here? 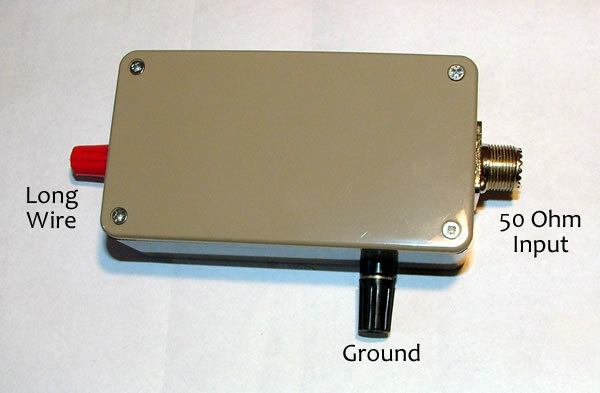 Yes, this is designed for the middle to upper part of the HF spectrum, not VHF.